Photos, Info & Biography of Werner "Mr.W" Skolimowski's Life, Artwork & Accomplishments. in Marburg (an der Lahn), Germany. He grew up in Hamburg, Germany. 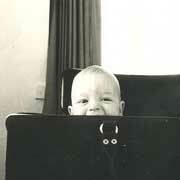 Already as a small child Werner painted & drew constantly. He was born with the need to paint & draw. During the early 80's when the graffiti movement in Hamburg started, Werner Skolimowski got instantly captured. 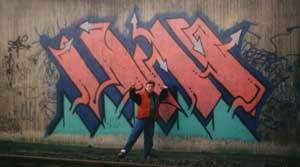 1984 he started his graffiti carrer as "Mr.W." 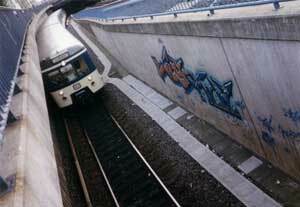 The walls & trains of Hamburg's transit system became Mr.W's canvas. Hundred thousands of viewers could enjoy his graffiti artwork from the trains daily. Traditional galleries never had that many visitors. That made the challenge of painting in the dark worth the effort. The name Mr.W spread throughout the city. Since creating art & adding beauty to the world was more important to Mr.W. than the adventure-adrenalin-rush part of illegal graffiti, he always looked for possibillities to paint his graffiti art with permission. In 1988 Werner "Mr. W." Skolimowski organized a wall which was located directly on a busy train line, where he could paint legally at day time with everybody watching & no rush to paint. Mr.W shared this place with other graffiti artists & turned it into Hamburgs first "Graffiti Hall Of Fame", where everybody was welcome to paint graffiti legally! Painting in the daylight right in front of a large audience, brought Werner "Mr.W" Skolimowski even more citywide recognition & opportunities. Articles about Mr.W's work & Hamburgs first "Legal Graffiti Wall" were printed in several local newspapers. Many other legal wall & even paid for oportunities followed for Mr.W after getting all this exposure. Mr.W was the first one to paint the new "Graffiti Hall Of Fame" Volksparkstraße at Kieler Straße in Hamburg. Painting at daytime with no rush at all, made it possible to paint larger, cleaner & much more detailed then ever before. Mr.W was able to experiment with new paint techniques & try out many new ideas. 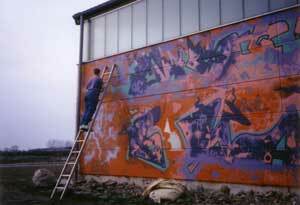 His unique style & new way of painting graffiti, influenced many other graffiti writers. 1989 Werner "Mr. W" Skolimowski won the award "Frische Farbe Graffiti: Kunst bei der Bundesbahn"
(the 1. official graffiti contest made by the city of Hamburg). Because of this exposure Mr.W had the opportunity to appear on several German TV shows. After an interview on RIAS TV in West Berlin, Mr.W. 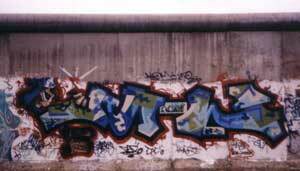 even had the chance to graffiti paint the Berlin wall. 1990 Werner "Mr.W" Skolimowski moved to Kassel, Germany. There Mr.W. had the possibility to paint & experiment with ideas in his own studio. Mr.W's graffiti projects and paintings got granted with a 1. Prize "100 Jahre Industriekultur des AGV Metal". 1991 a church hired "Mr. W" to graffiti the word "Jesus" onto their church wall. 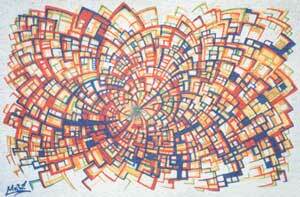 1992 Werner "Mr. W." Skolimowski had his first solo art show "Kunst in der Werkstatt". The TV Show "ZDF Fernsehgarten" invited Mr.W. 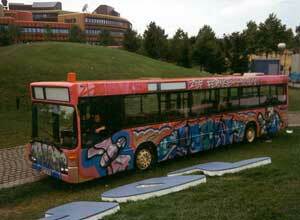 to paint a Mainz City Bus live on their 3 hour breakfast show. 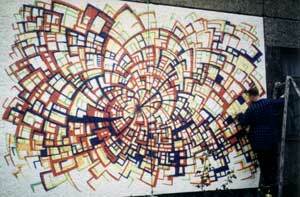 Werner "Mr. W." Skolimowski painted his first large scale "Raumstruktur" swirl in Weimar, Germany. 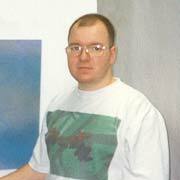 1993 Werner "Mr. W" Skolimowski had the position as one of the jurors for the 2. official graffiti contest made by the city of Hamburg. Mr. W. ended up staying there much, much longer! 1999 Werner "Mr.W." Skolimowski painted his largest graffiti mural so far, in Phoenix, Arizona. The size of this big mural painting is approximately 23 x 66 feet (7 x 20 meters). To save spray paint cans & time, Mr. W filled all the bigger areas with latex wall paint first, using a big paint roller. He used the spray paint cans only for the small details, graffiti designs & the outlines. This way it took about 60 gallons of latex wall paint, but only 40 cans of spray paint to finnish this huge wall mural. Mr. W. did this graffiti painting completely freestyle (not using a paper sketch or drawing), sketching & creating it right then & there onto the wall. Mr.W stayed only that summer.